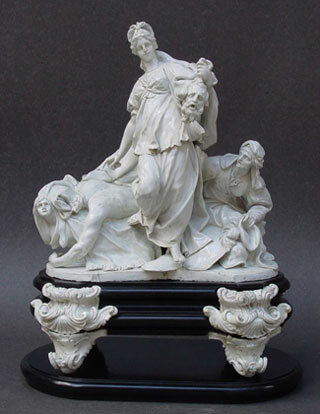 This white porcelain sculpture group was made at the Ginori porcelain factory, Doccia, Italy in the mid-eighteenth century. It stands on an ebonised wood base mounted at the corners with original white porcelain scroll supports. The piece exhibits several firing cracks, and there were several old slight repairs to some extremities and to the porcelain feet. Our conservation of the piece involved careful cleaning and improvement of the appearance of the old repairs. In 1737 the Tuscan Marquis Carlo Ginori set up a porcelain factory next to his countryside residence in Doccia, Italy, so Ginori porcelain is often referred to as Doccia porcelain.